After closing down for six weeks during the beginning of the war, the Amsterdam stock exchange opened its doors again on July 15, 1940. Because of the securities rehabilitation, the exchange was still dealing with restrictions on trade long after the war. To express their dissatisfaction, traders went on strike in1946. 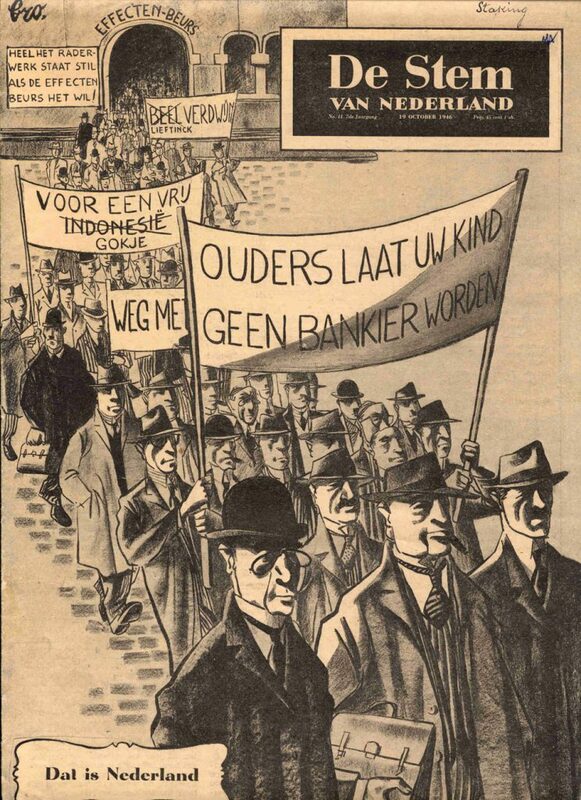 News magazine ‘Stem van Nederland’ responded with this cartoon. 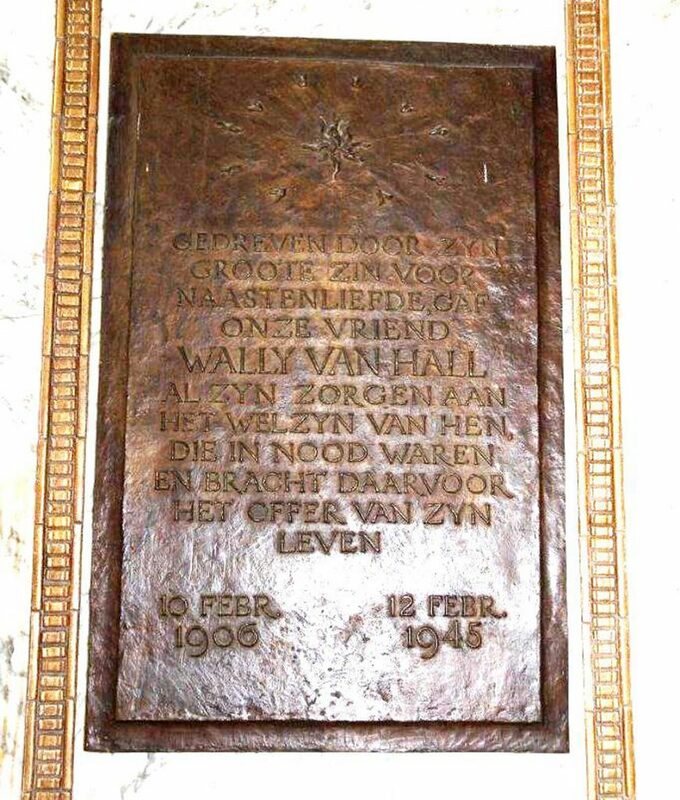 At Beursplein 5, a plaque still calls attention to the acts of resistance of Walraven van Hall (1906-1945), member of the stock exchange. As ‘banker of the resistance,’ he managed to collect a total of 83 million guilders during the war to finance people in hiding and resistance groups. 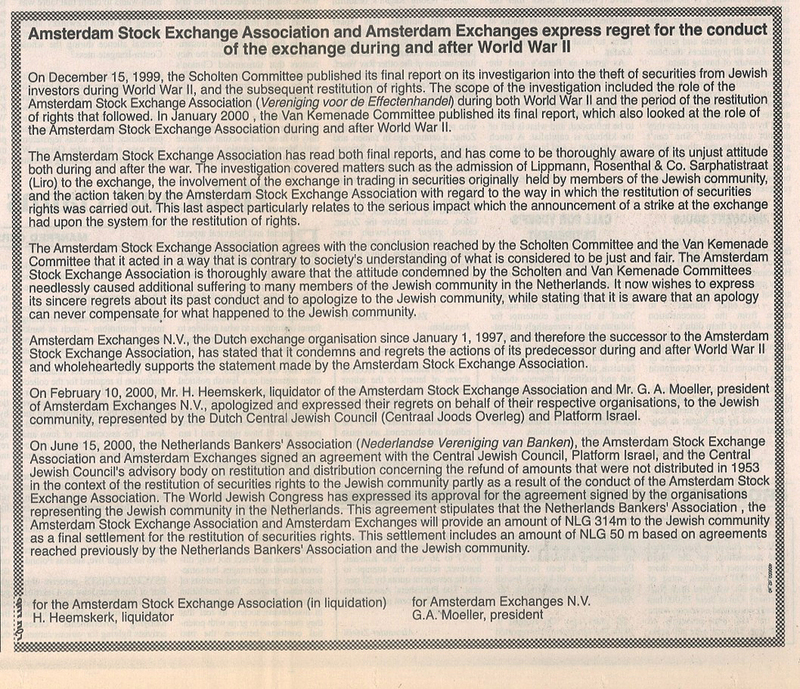 Part of the final completion of the securities rehabilitation in the Netherlands in 2000 was the publication of this expression of regret of the exchange in Dutch, Israeli, and American newspapers. 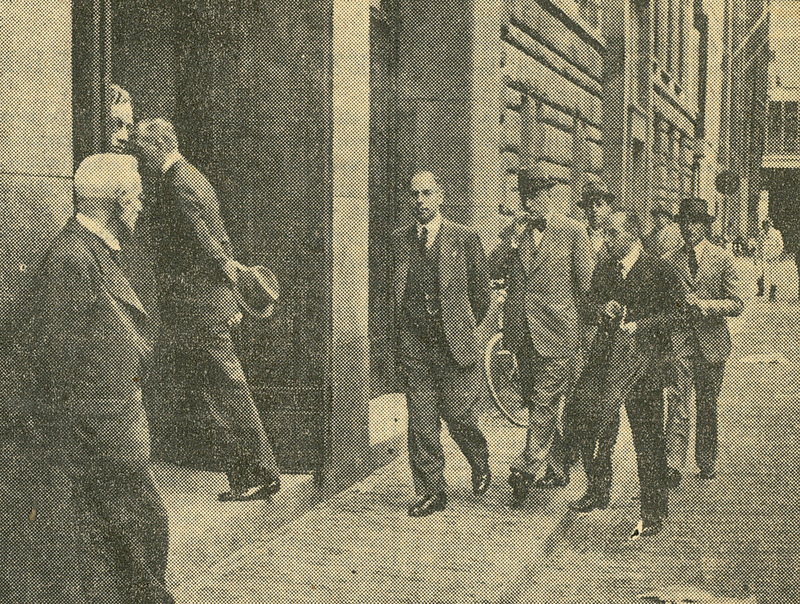 The German occupation had major consequences for the Dutch economy. The Treasury suffered greatly from provision that the Netherlands by decree had to pay towards the costs of German warfare, as well as the occupation itself. The result was that the national debt rose from 4 to 20 billion guilders between 1939 and 1945. Forced export of goods to Germany led to scarcity and prices that were sometimes a hundred times higher than before the war. The lack of goods also meant that people started using their money in other ways. There was a greater demand for securities, people were saving three times as much, more life insurance policies were purchased, and whoever had a mortgage, paid it off more quickly. Most of the time during the occupation, the stock exchange remained open, but it was checked and restricted by the Germans. A very painful measure was the denial of access to the stock exchange to Jewish members. A low point in the history of the Amsterdam stock exchange is the resale of securities that the occupier had looted from Dutch Jews on the exchange floor. After the war, the restoration of rights as well as the role the Vereniging voor de Effectenhandel had played in the matter was a sensitive and lingering issue. In 1953, an arrangement was made that allowed the Jewish owners to get back 90 percent of the value of the stolen securities. In the year 2000, this matter was definitely finalized, and the exchange issued an apology. At the same time, the remaining 10 percent (including benefits) were paid back.